9 October 1955: Lieutenant Colonel Robert Ray Scott, United States Air Force, commanding officer, 510th Fighter Bomber Squadron, 405th Fighter Bomber Wing, Langley Air Force Base, Virginia, with Major Robert C. Ruby and Captain Charles T. Hudson, flew their Republic F-84F Thunderstreaks non-stop from Los Angeles Airport (LAX), on the southern California coastline, to overhead Floyd Bennett Field, New York. Two in-flight refuelings from Boeing KB-29 tankers were required. Colonel Scott’s flight set a new National Aeronautic Association speed record with an elapsed time of 3 hours, 44 minutes, 53.88 seconds. NEW YORK (AP) — Two air force pilots from Des Moines broke the speed record from Los Angeles to New York Wednesday, making a nonstop flight in less than four hours. 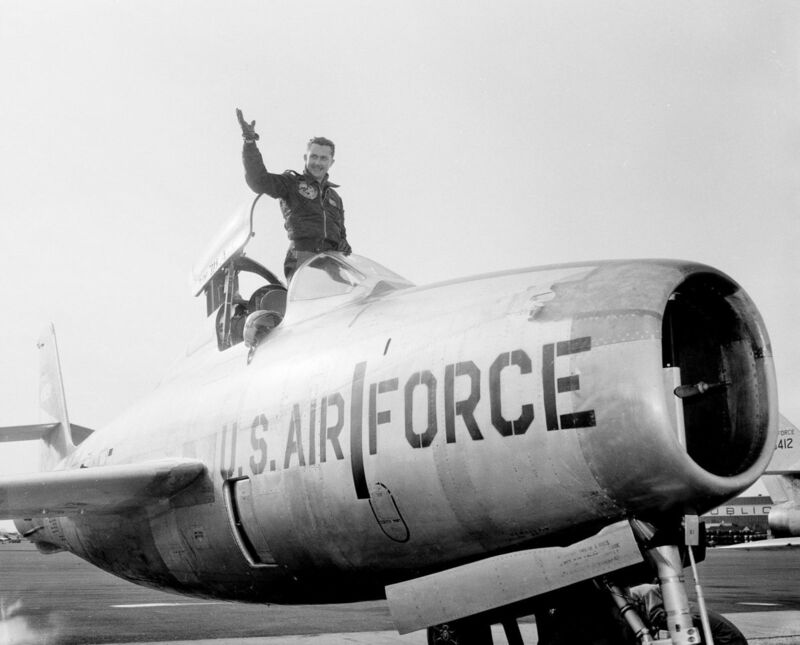 Lt. Col. Robert R. Scott, 34, flying a Republic F-84F Thunderstreak jet fighter, turned in the fastest time — 3 hours 46 minutes and 33 seconds. He averaged 649 miles an hour. Just one minute behind was another Des Moines pilot, Maj. Robert C. Ruby, 32. His time was 3:47:33. 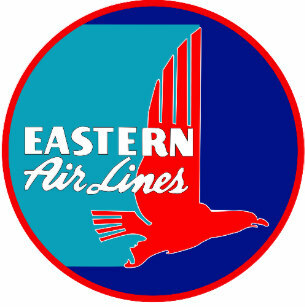 The old mark for the 2,445-mile route was 4:06:16, set Jan 2, 1954, by an air national guard pilot. The pilots said they could have made faster time except for slow and obsolete in-flight refueling tanker planes. A third pilot who shattered the old mark is Capt. Charles T. Hudson, 33, of Gulfport, Miss., who made the flight in 3:49:53. Eight air force Thunderstreaks left Los Angeles in a mass assault on the record. Five dropped out through failure to make contact with refueling planes or other reasons. All reportedly landed safely. While setting a Los Angeles–New York record, Scott failed to beat the navy’s time from San Diego, Calif., to New York — 2,438 miles, or seven miles shorter than Wednesday’s flight. Lt. Comdr. Francis X. Brady, 33, of Virginia Beach, Va., flew from San Diego in 3:45:30 on April 1, 1954, flying a Grumman F9F Cougar. The air force planes flew at about 40,000 feet. “The tankers used for refueling are much too obsolete and too old,” Scott commented on landing. The jets had to slow to 200 m.p.h. from almost 650 to take on fuel. Scott said he refueled twice — once near La Junta, Colo., and once near Rantoul, Ill.
Ruby and Hudson also said they could have made faster time if the tank planes were more modern. 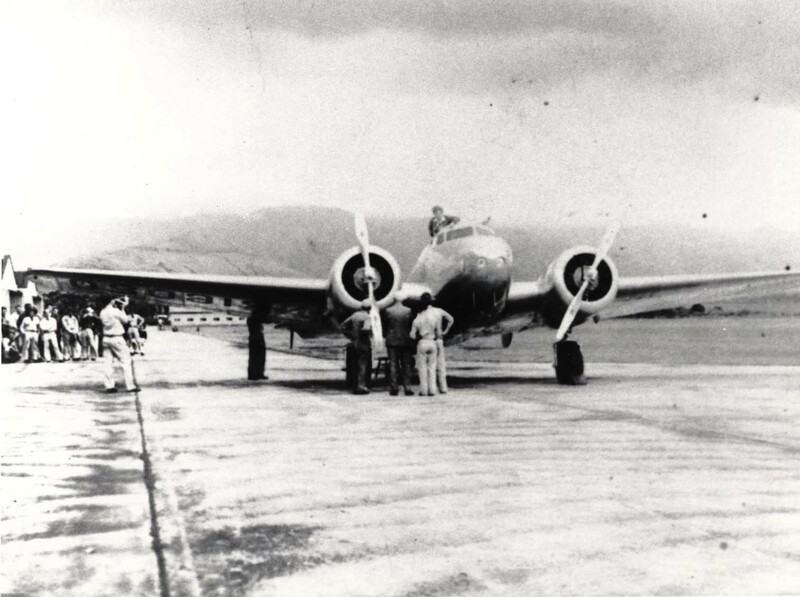 Hudson and Ruby carried extra gas tanks and made one in-flight refueling each. Scott carried no extra gas and had two in-flight refuelings. 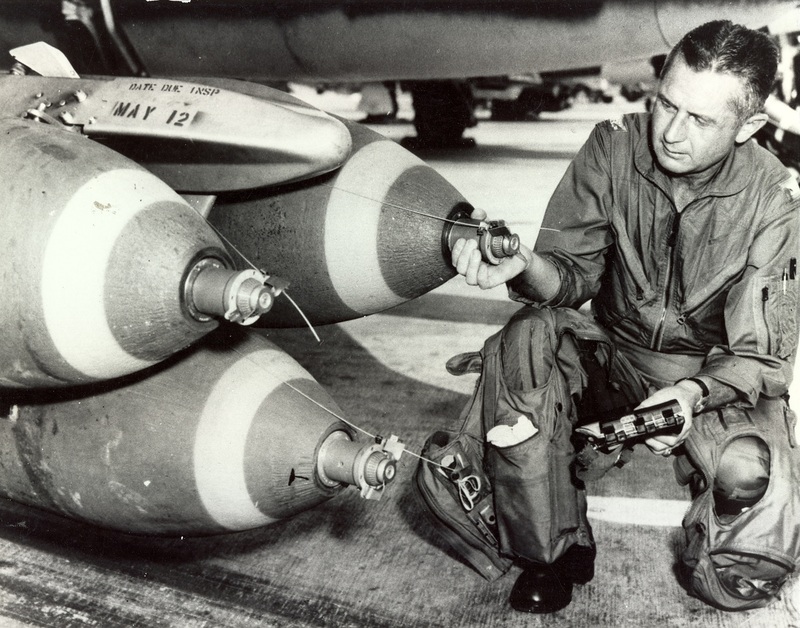 1st Lt. James E. Colson of Middleboro, Ky., tried to make it with no refueling. He got as far as Pittsburgh, Pa.
Of the other four unable to complete the flight, one dropped out in California, two in Kansas and one at Sedalia, Mo. Robert Ray Scott was born at Des Moines, Iowa, 1 November 1920. He was the first of two children of Ray Scott, a railroad worker, and Elva M. Scott. 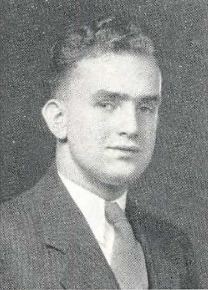 He graduated from North High School in Des Moines, January 1939. He studied aeronautical engineering at the University of Iowa for two years before he enlisted as an Aviation Cadet in the U.S. Army Air Corps, 15 August 1941. Scott was 5 feet, 7 inches (1.70 meters) tall and weighed 144 pounds (65.3 kilograms). He was trained as a pilot and and was commissioned as a Second Lieutenant, 16 March 1942. He was assigned as an instructor pilot in California, and was promoted to 1st Lieutenant 15 December 1942. 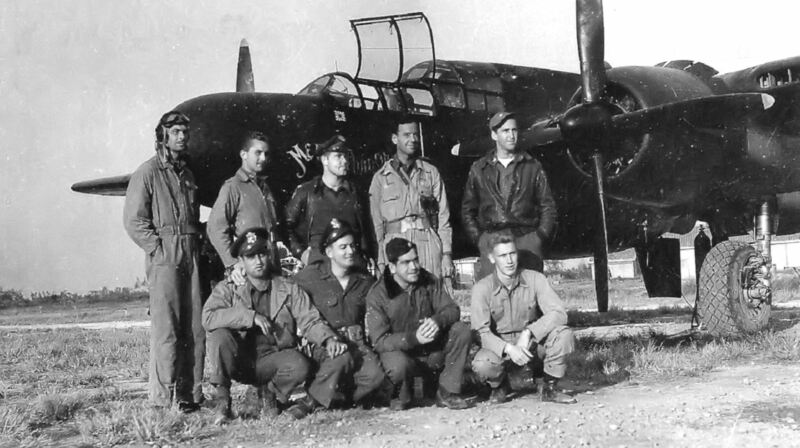 Scott was transferred to the 426th Night Fighter Squadron, 14th Air Force, flying the Northrop P-61 Black Widow in India and China. He was promoted to captain, 3 May 1944, and to major, 16 August 1945. Major Scott was credited with shooting down two enemy aircraft. 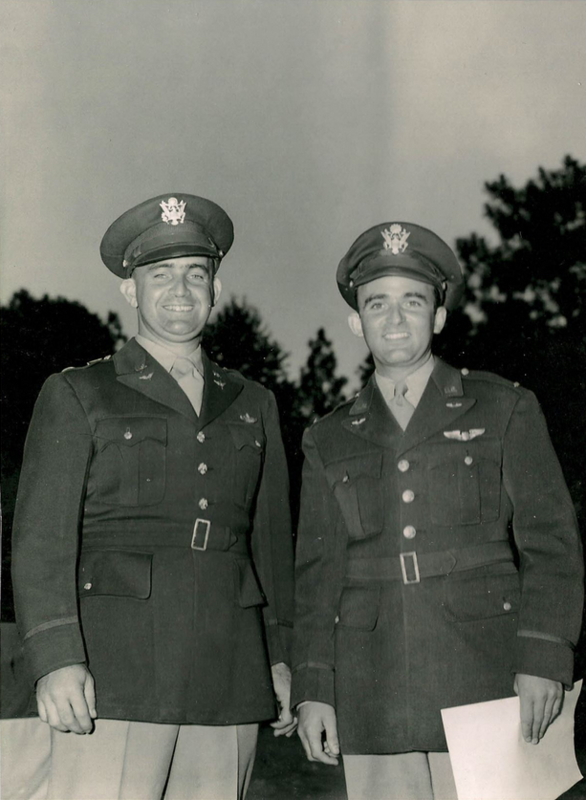 He was awarded the Distinguished Flying Cross and the Air Medal. Following World War II, Major Scott returned to the University of Iowa to complete his bachelor’s degree. He also earned two master’s degrees. In 1952 he graduated from the Air Force test pilot school at Edwards Air Force Base, then served as a project pilot on the North American F-86D all-weather interceptor. Later he was a project officer at Edwards AFB on the Republic F-105 Thunderchief Mach 2 fighter-bomber. 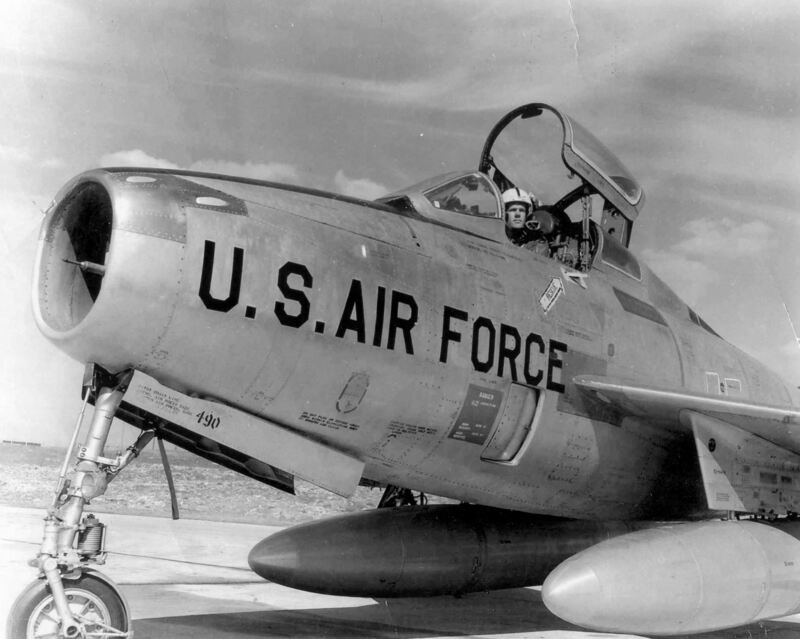 Scott flew the North American Aviation F-86F Sabre during the Korean War. From January to July 1953, he flew 117 combat missions. 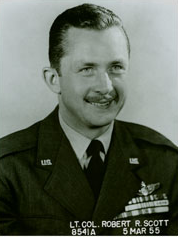 From 1953 to 1956, Lieutenant Colonel Scott commanded the 405th Fighter Bomber Wing, Tactical Air Command, at Langley Air force base, Virginia. Scott was promoted to the rank of Colonel in 1960. During the Vietnam War, Colonel Scott commanded the 355th Tactical Fighter Wing, flying 134 combat missions in the Republic F-105 Thunderchief. 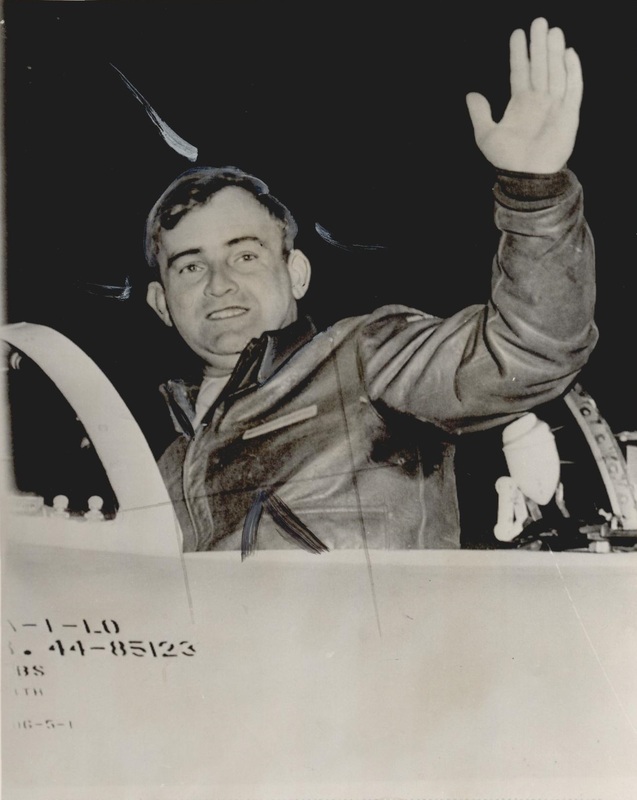 On 26 March 1967 he shot down an enemy MiG-17 fighter near Hanoi with the 20 mm M61 Vulcan cannon of his F-105D-6-RE, 59-1772, making him only the second Air Force pilot with air combat victories in both World War II and Vietnam. Colonel Scott’s final command was the 832nd Air Division, 12th Air Force, at Cannon Air Force Base, New Mexico. He retired 1 September 1970 after 29 years of military service. Colonel Robert Ray Scott flew 305 combat missions in three wars.During his Air Force career, Colonel Scott was awarded four Silver Star medals, three Legion of Merit medals, six Distinguished Flying Crosses and 16 Air Medals. He died at Tehachapi, California, 3 October 2006 at the age of 86 years. He is buried at the Arlington National Cemetery. The Republic F-84F Thunderstreak was an improved, swept-wing version of the straight-wing F-84 Thunderjet fighter bomber. The first production Thunderstreak, 51-1346, flew for the first time, 22 May 1952, with company test pilot Russell M. (Rusty”) Roth in the cockpit. 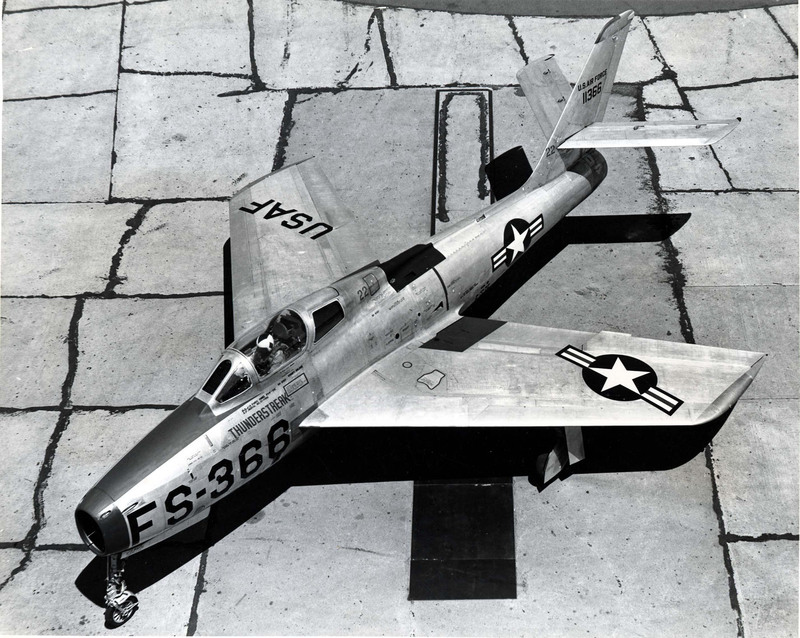 The F-84F was 43 feet, 4¾ inches (13.227 meters) long with a wingspan of 33 feet, 7¼ inches (10.243 meters) and overall height of 14 feet, 4¾ inches (4.388 meters). The wings were swept aft 40° at 25% chord. Their angle of incidence was 1° 30′ and there was no twist. 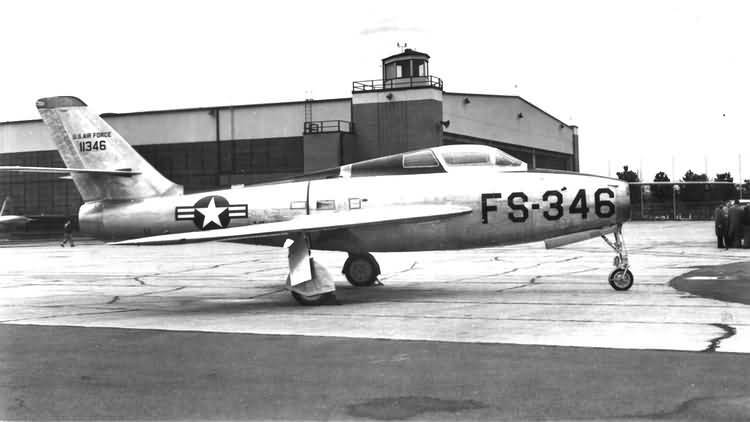 The F-84F had 3° 30′ anhedral. The Thunderstreak had an empty weight if 13,645 pounds (6,189 kilograms) and maximum takeoff weight of 27,000 pounds (12,247 kilograms). 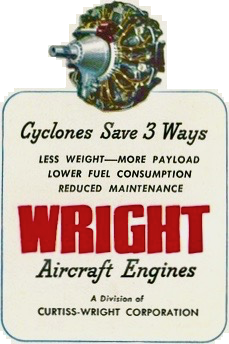 The initial F-84F-1-RE aircraft were powered by a Wright J65-W-1 turbojet, a license-built variant of the British Armstrong Siddely Sapphire. Later versions used Wright J65-W-3 and J65-W-7, or Buick J65-B-3 or J65-B-7 engines. The J65-B-3 was a single-shaft axial-flow turbojet with a 13-stage compressor section and 2-stage turbine. The W-3/B-3 had a continuous power rating of 6,350 pounds of thrust (28.25 kilonewtons) at 8,000 r.p.m. It produced 7,220 pounds of thrust (32.12 kilonewtons) at 8,300 r.p.m. (5-minute limit). The J65-B-3 was 10 feet, 8.6 inches (3.266 meters) long, 3 feet, 1.7 inches (0.958 meters) in diameter, and weighed 2,785 pounds (1,263 kilograms). 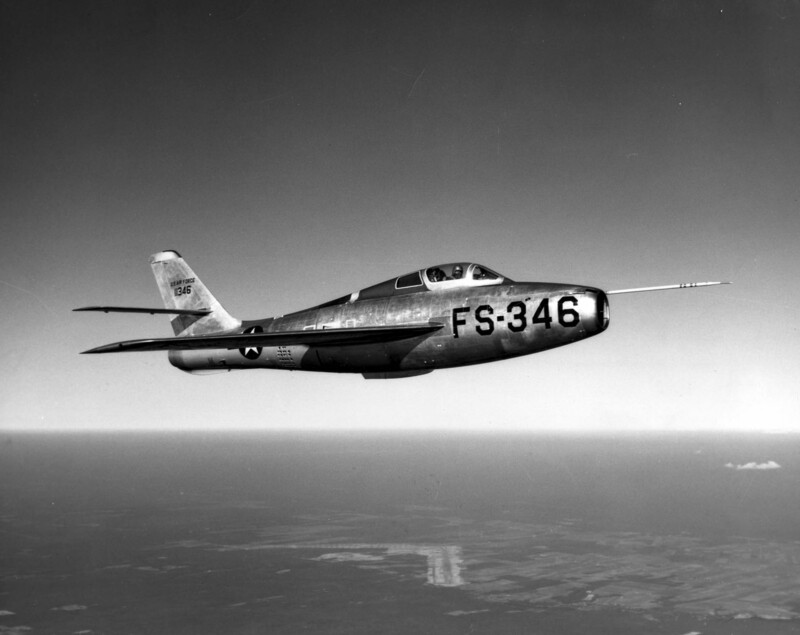 The F-84F had a maximum speed of 595 knots (685 miles per hour/1,102 kilometers per hour) at Sea Level (0.900 Mach). The fighter bomber could climb at 7,000 feet per minute (36 meters per second). Its service ceiling was 44,450 feet (13,548 meters). The fighter bomber’s maximum ferry range was 2,010 nautical miles (2,313 statute miles/3,723 kilometers). Armament consisted of six Browning .50-caliber (12.7 × 99 NATO) AN-M3 aircraft machine guns, with two mounted in the wing roots and four in the nose. The were 300 rounds of ammunition per gun. Up to 6,000 pounds (2,722 kilograms) of bombs and rockets could be carried under the wings. A variable-yield Mark 7 tactical nuclear weapon could also be carried. Between 1952 and 1957, 2,112 F-84F Thunderstreaks were built by Republic at Farmingdale, New York, and by General Motors at Kansas City, Kansas. The Thunderstreak served with the United States Air Force and Air National Guard until 1971. 26 January 1946: Colonel William Haldane Councill, U.S. Army Air Forces, a test pilot at the Flight Test Division, Wright Field, Ohio, made a record-breaking flight from Daugherty Field (Long Beach Airport), California, to overhead LaGuardia Airport, New York, in 4 hours, 13 minutes, 26 seconds. He was piloting a Lockheed P-80A-1-LO Shooting Star, serial number 44-85123. Colonel Councill flew as high as 41,000 feet (12,497 meters), but stayed at 35,000 feet (10,668 meters) for most of the flight. This flight set a new transcontinental speed record for the 2,457 miles (3,954 kilometers), averaging 584.82 miles per hour (941.18 kilometers per hour). The National Aeronautic Association representative, John P. V. Heinmuller, was the official timer. (Mr. Heinmuller was the Chief Timer of both the N.A.A. and the Fédération Aéronautique Internationale. He was president of the Longines-Wittnauer Watch Co., inc. He had also timed Lindbergh’s transatlantic flight in 1927. 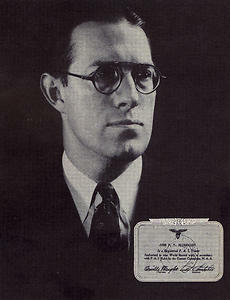 Mr. Heinmuller was the author of Man’s Fight to Fly: Famous World-Record Flights and a Chronology of Aviation, 1944). 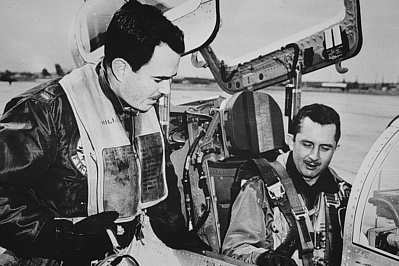 Colonel Councill was accompanied by two other P-80s flown by Captain John S. Babel and Captain Martin I. Smith. This was the longest non-stop flight by a jet aircraft up to that time. The P-80s flown by Captains Babel and Smith also had the nose fuel tank installed, but carried 150-gallon (569 liters) wing tip tanks. They had to stop at Topeka, Kansas, to refuel. Ground crews met them with four fuel trucks, and they were airborne in 4 minutes and 6 minutes, respectively. William Haldane Councill was born 5 October 1911 at Bellevue, Pennsylvania. He was the second of four children of William Mansfield Councill, a manager for a fireproofing company, and Bertha Etta Wing Councill. He attended Perry High School, where he was a member of the Aero Club. Bill Councill studied at the Carnegie Institute of Technology, Pittsburgh, Pennsylvania. He was a member of the Reserve Officers Training Corps (R.O.T.C. ), and the Delta Upsilon (ΔΥ) fraternity. He was also a member of the Scabbard and Blade, and co-chairman of the Military Ball. Councill graduated in 1933 with the degree of Bachelor of Science in Mechanical Engineering (B.S.M.E.). William H. Councill was commissioned as a second lieutenant, Engineer Reserve, 1 June 1933. He was appointed a flying cadet and trained as a pilot, 1 October 1933 to 14 October 1935. He then received a commission as a second lieutenant, Air Reserve. Lieutenant Councill married Miss Lillie Louise Slay at Wahiawa Heights, Honolulu, Territory of Hawaii, 18 April 1936. They would have one daughter, Frances, born in 1943. On 1 October 1938, Councill’s reserve commission was converted to second lieutenant, Air Corps, United States Army. Councill was promoted to first lieutenant, 1 October 1941. During this time William Councill held a parallel commission in the Army of the United States. He was promoted to first lieutenant, A.U.S., 9 September 1940, and captain, A.U.S., 1 February 1942. On 1 March 1942, he was promoted to the rank of major, A.U.S. (A.C.), and to lieutenant colonel, 19 December 1942. On 3 July 1945, Councill advanced to the rank of colonel, A.U.S. Colonel Councill was rated as a command pilot. During World War II, he flew 130 combat missions with the the Lockheed P-38 Lightning .Thirteenth Air Force in the southwest Pacific area. He is credited with shooting down three enemy aircraft, and was awarded the Distinguished Flying Cross for his actions in an air battle over the Solomons, 15 January 1943. 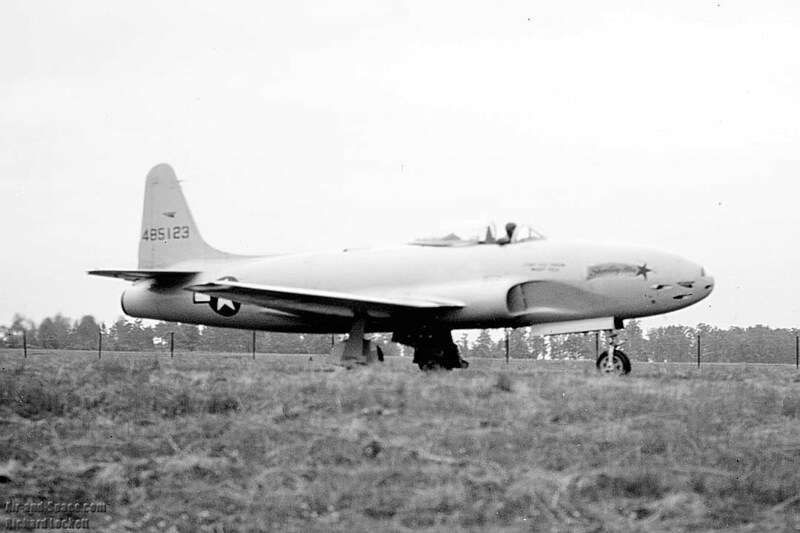 At 10:54 a.m., 5 April 1954, Colonel Councill took off from the Republic Aviation Company plant at Farmingdale, New York, in a Lockheed T-33A Shooting Star, en route to Langley Field, Virginia. He never arrived. An extensive search, other than locating a single wing tank, was unsuccessful. It was presumed that Councill went down in the Atlantic Ocean. 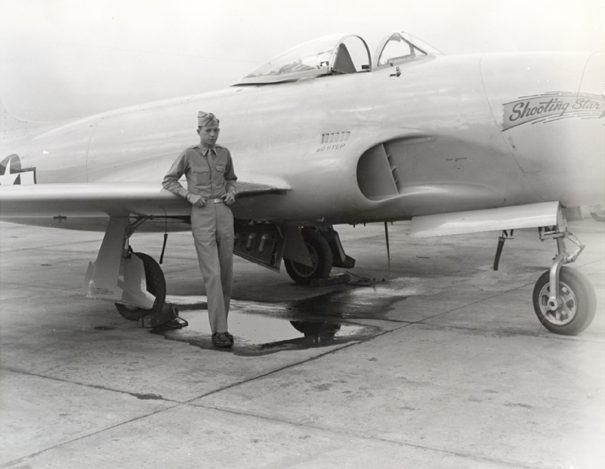 The P-80A was a day fighter, and was not equipped for night or all-weather combat operations. The P-80A was 34 feet, 6 inches (10.516 meters) long with a wingspan of 38 feet, 10.5037 inches (11.84919 meters) ² and overall height of 11 feet, 4 inches (3.454 meters). The leading edges of the P-80A’s wings were swept aft 9° 18′ 33″. They had an angle of incidence of +1° at the root and -1° 30′ twist. There was 3° 50′ dihedral. The total wing area was 237.70 square feet (22.083 square meters). The fighter had an empty weight of 7,920 pounds (3,592 kilograms) and a gross weight of 11,700 pounds (5,307 kilograms). The maximum takeoff weight was 14,000 pounds (6,350 kilograms). 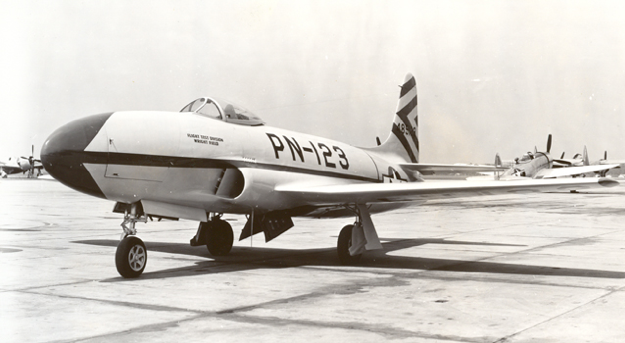 Early production P-80As were powered by either an Allison J33-A-9 or a General Electric J33-GE-11 turbojet engine. The J33 was a licensed version of the Rolls-Royce Derwent. 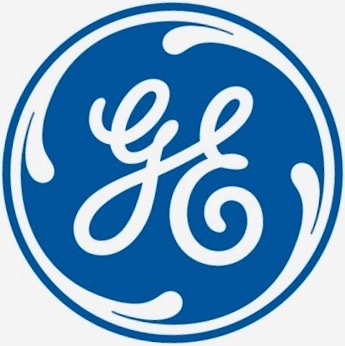 It was a single-shaft turbojet with a 1-stage centrifugal compressor section and a 1-stage axial-flow turbine. The -9 and -11 engines were rated at 3,825 pounds of thrust (17.014 kilonewtons). The J33s were 8 feet, 6.9 inches (2.614 meters) long, 4 feet, 2.5 inches (1.283 meters) in diameter and weighed 1,775 pounds (805 kilograms). 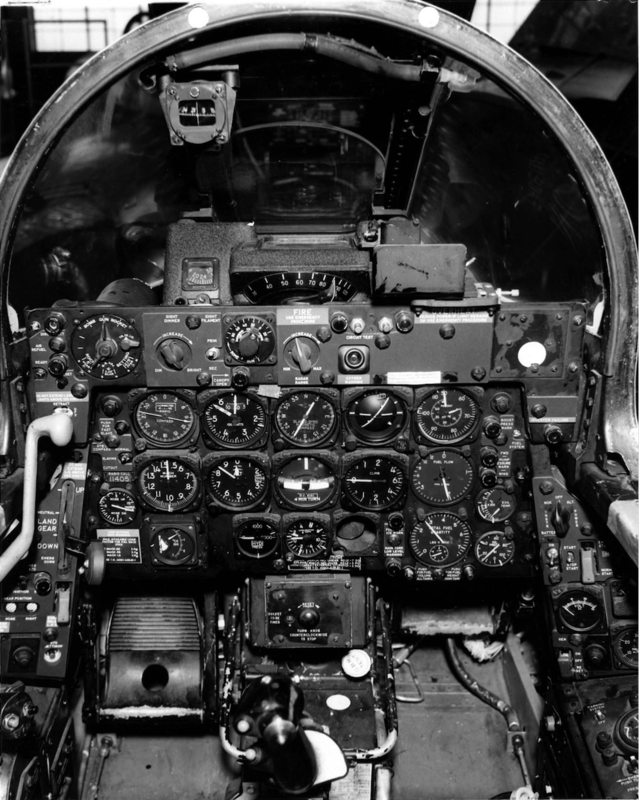 The P-80A had a cruising speed of 445 miles per hour (716 kilometers per hour) at 20,000 feet (6,096 meters). Its maximum speed was 548 miles per hour (882 kilometers per hour) at 2,700 feet (823 meters) and and 501 miles per hour (806 kilometers per hour) at 34,700 feet (10,577 meters). The service ceiling was 45,000 feet (13,716 meters). The P-80A Shooting Star was armed with six air-cooled Browning AN-M2 .50-caliber aircraft machine guns mounted in the nose. On 2 September 1946, Major Gustav Lindquist won the Thompson Trophy Race, J Division, at the National Air Races, Cleveland, Ohio, 1946, with the same airplane, averaging 515.853 miles per hour (830.185 kilometers per hour) over a 180-kilometer (111.85-mile) course. 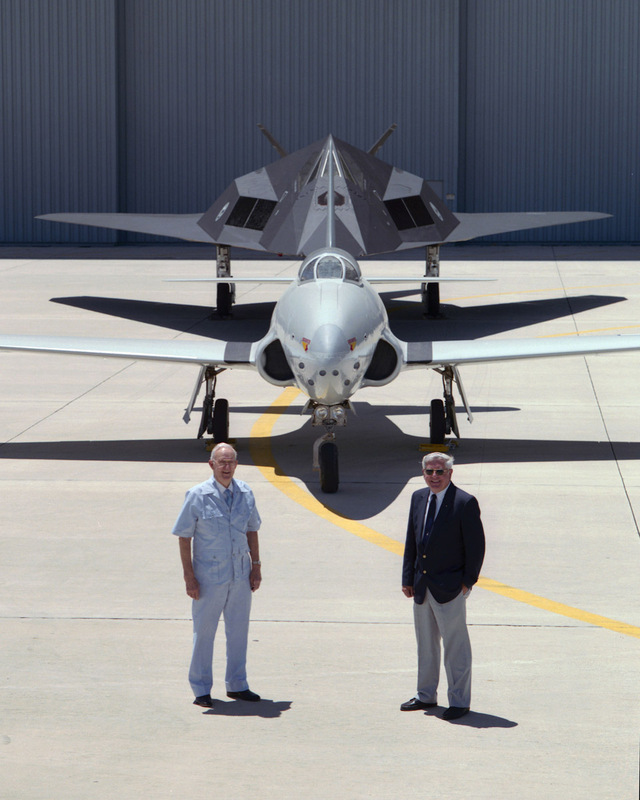 Today, 44-85123 is in the collection of the Air Force Flight Test Museum, Edwards Air Force Base. 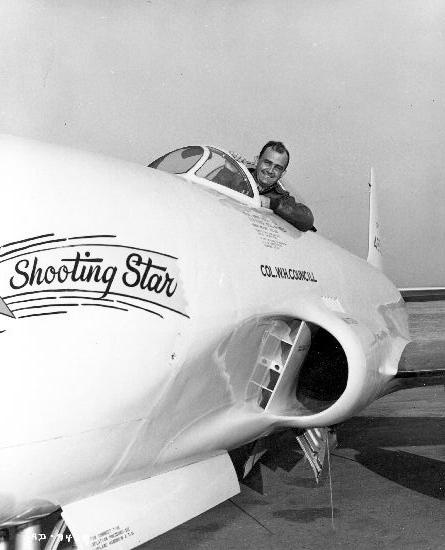 ¹ Thanks to Jeffrey P. Rhodes of Lockheed Martin for additional information on Colonel Councill’s Lockheed P-80A Shooting Star. ² Wing span with rounded wing tips. 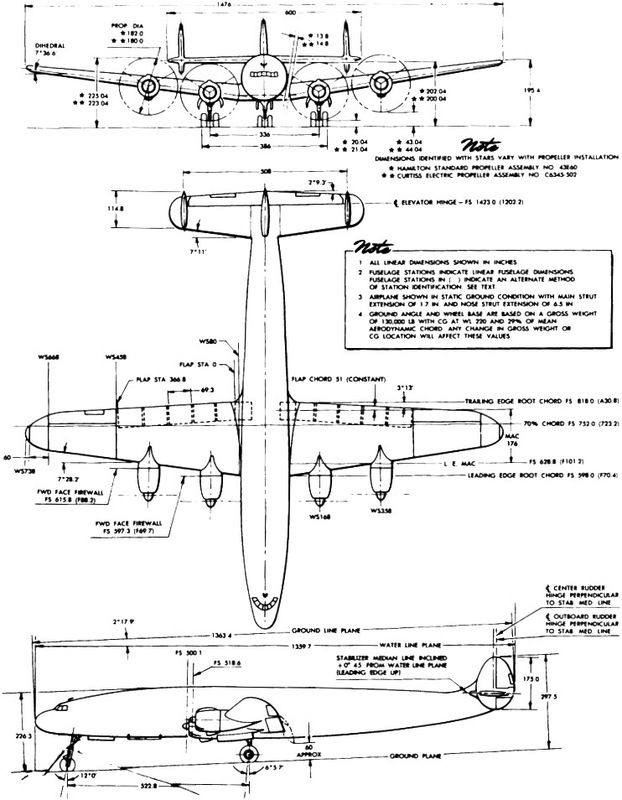 P-80As with squared (“clipped”) tips had a wing span of 37 feet, 7.5037 inches (11.46819 meters). 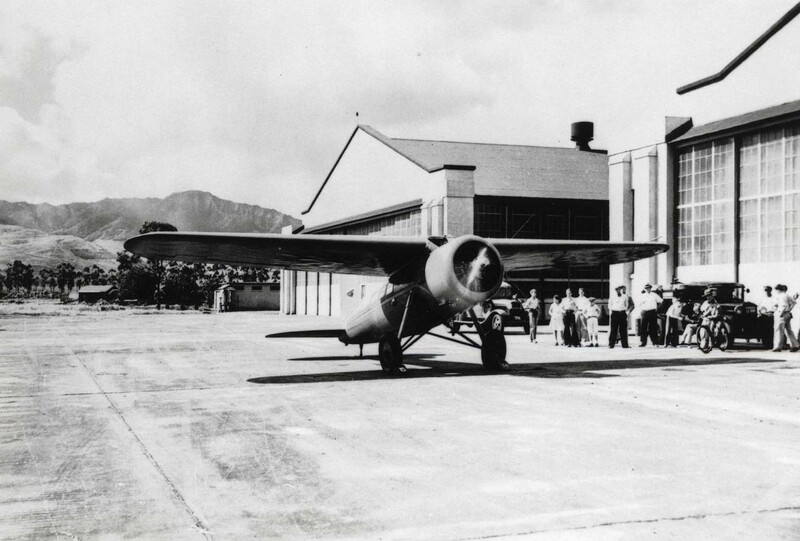 11 January 1935: At 4:40 p.m., local time, Amelia Earhart departed Wheeler Field on the island of Oahu, Territory of Hawaii, for Oakland Municipal Airport at Oakland, California, in her Lockheed Vega 5C Special, NR965Y. She arrived 18 hours, 15 minutes later. 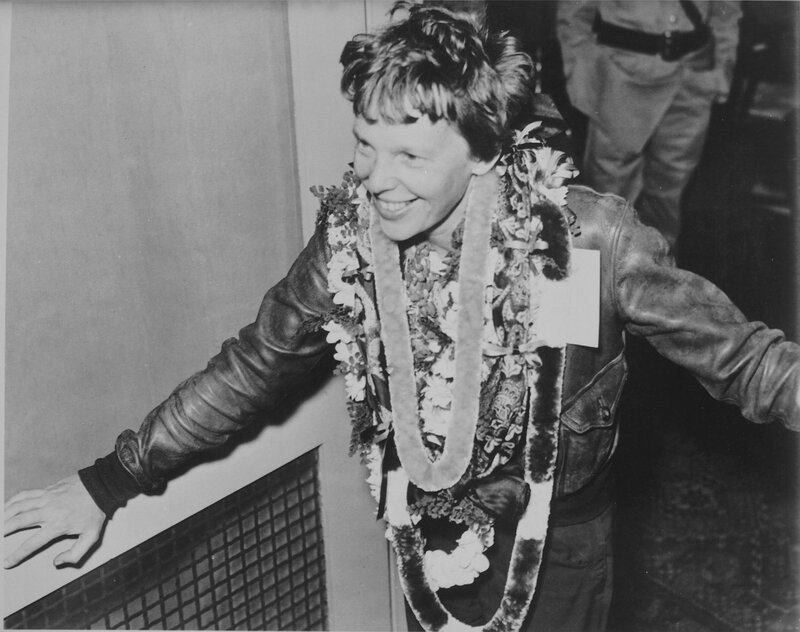 Earhart was the first person to fly solo from Hawaii to the Mainland. Built by the Lockheed Aircraft Company, the Model 5 Vega is a single-engine high-wing monoplane designed by John Knudsen (“Jack”) Northrop and Gerrard Vultee. 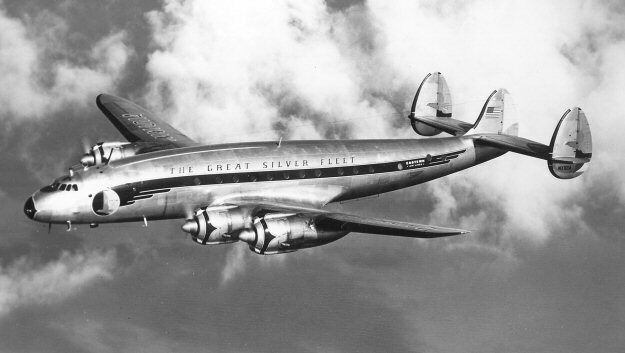 It was a very state-of-the-art aircraft for its time. It used a streamlined monocoque fuselage made of spiral strips of vertical grain spruce pressed into concrete molds and held together with glue. The wing and tail surfaces were fully cantilevered, requiring no bracing wires or struts to support them. The techniques used to build the Vega were very influential in aircraft design. 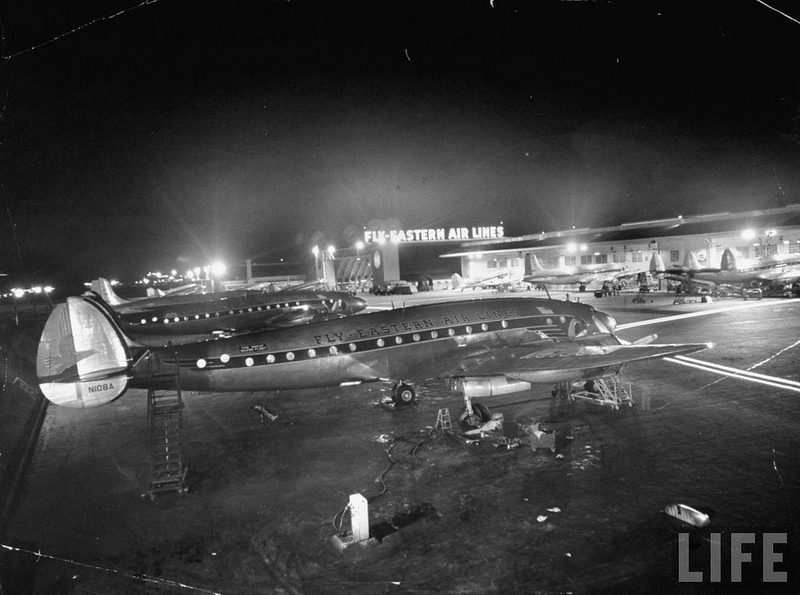 It also began Lockheed’s tradition of naming its airplanes after stars or other astronomical objects. 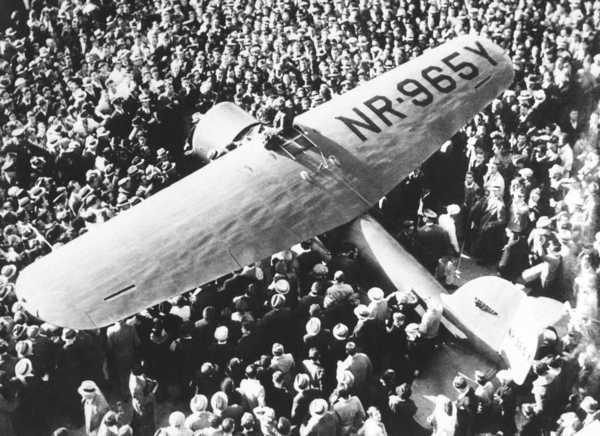 Lockheed Model 5C Vega serial number 171 was completed in March 1931, painted red with silver trim, and registered NX965Y. The airplane had been ordered by John Henry Mears. 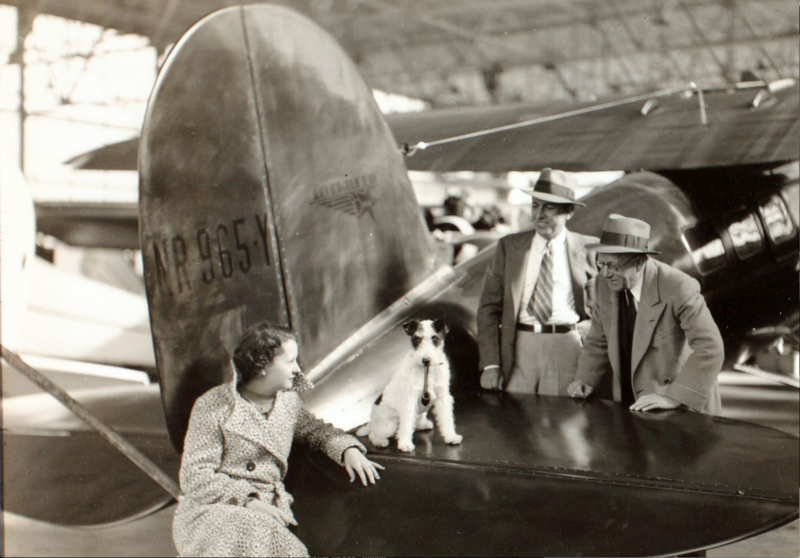 Mears did not take delivery of the new airplane and it was then sold to Elinor Smith. 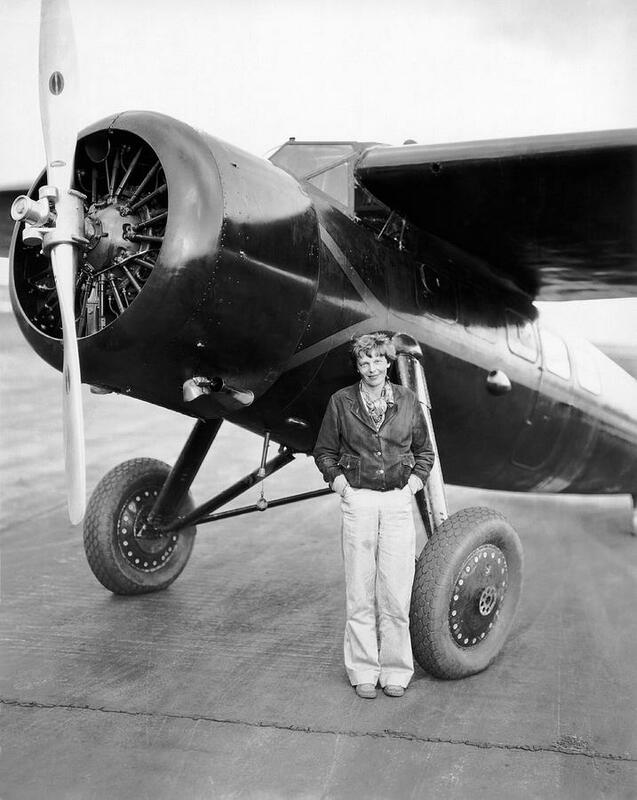 It was resold twice before being purchased by Amelia Earhart in December 1934. 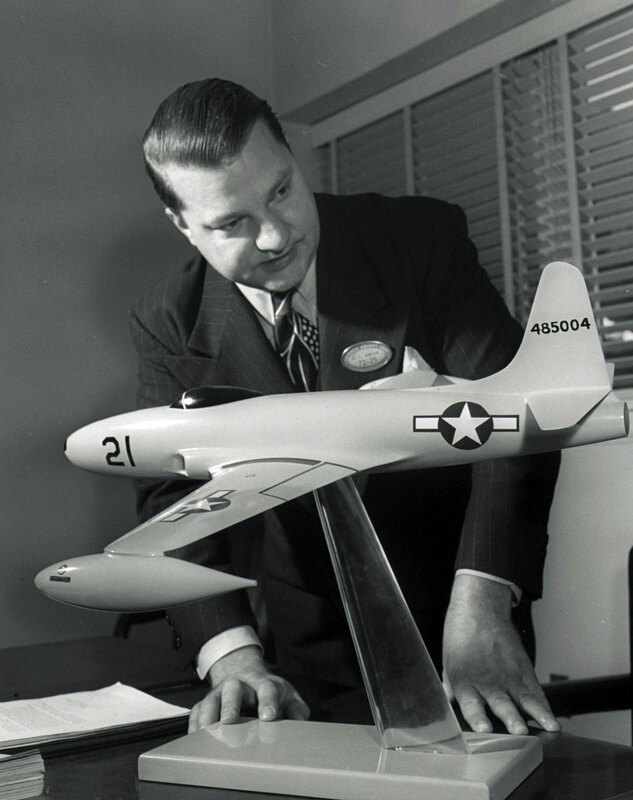 The Lockheed Model 5C Vega is 27 feet, 6 inches (8.382 meters) long with a wingspan of 41 feet (12.497 meters) and overall height of 8 feet, 2 inches (2.489 meters). Its empty weight is 2,595 pounds (1,177 kilograms) and gross weight is 4,500 pounds (2,041 kilograms). 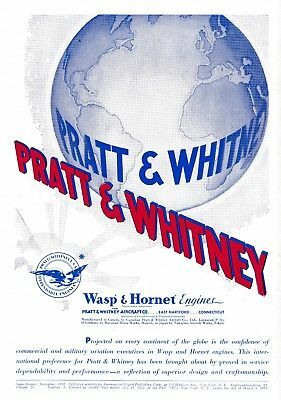 Earhart’s Vega 5C was powered by an air-cooled, supercharged, 1,343.804-cubic-inch-displacement (22.021 liter) Pratt & Whitney Wasp C, serial number 2849, a single-row, nine cylinder, direct-drive radial engine with a compression ratio of 5.25:1. The Wasp C was rated at 420 horsepower at 2,000 r.p.m. at Sea Level, burning 58-octane gasoline. It was 3 feet, 6.63 inches (1.083 meters) long with a diameter of 4 feet, 3.44 inches (1.307 meters) and weighed 745 pounds (338 kilograms). The standard Model 5C had a cruise speed of 165 miles per hour (266 kilometers per hour) and maximum speed of 185 miles per hour (298 kilometers per hour). The service ceiling was 15,000 feet (4,570 meters) and range in standard configuration was 725 miles (1,167 kilometers). — The Sound of Wings by Mary S. Lovell, St. Martin’s Press, New York, 1989, Chapter 17 at Page 206. — Amelia: The Centennial Biography of an Aviation Pioneer by Donald M. Goldstein and Katherine V. Dillon, Brassey’s, Washington and London, 1997, Chapter 13 at Page 132. 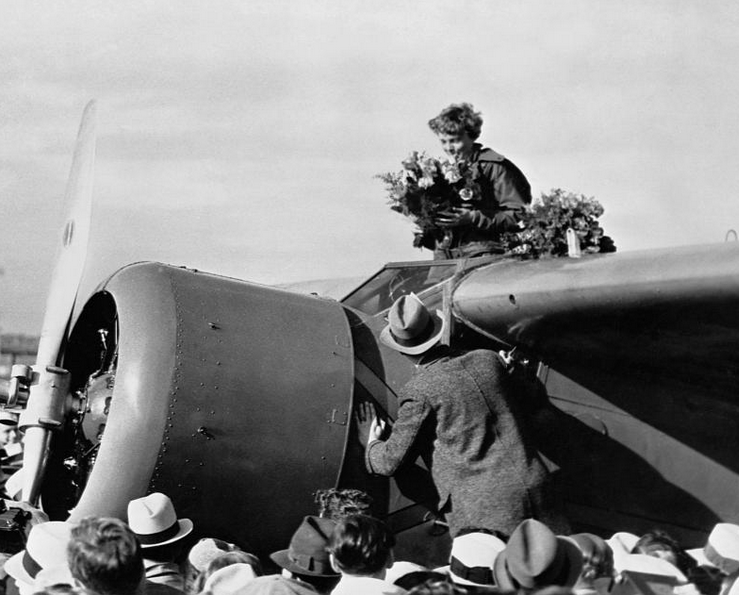 Amelia Earhart sold the Vega in 1936. It appeared in “Wings in the Dark,” (Paramount Pictures, 1935), and “Border Flight,” (Paramount Pictures, 1936) which starred Frances Farmer, John Howard and Robert Cummings. It changed hands twice more before being destroyed in a hangar fire 26 August 1943.